Crude oil prices have been weakening again for the past few weeks on a supply glut in the US. Despite the tumbling number of active rigs, the US is pumping more oil than at any time, pulling crude oil prices to a 6-year low. Oil futures lost 15% on Brent and 18-19% on NYMEX in the past two weeks. The persistent appreciation of the US dollar against other currencies has also played a role in this plunge on crude oil prices, according to ChemOrbis. Spot naphtha prices have responded to the developments in the crude oil markets, retreating by 10-12% to fall below the $500/ton threshold both in Asia and Europe. 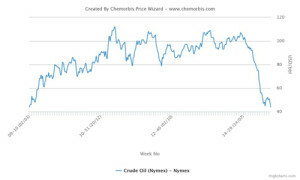 Spot ethylene and propylene prices, on the other hand, have not been affected much by this downturn in the energy markets yet owing to tightness for monomers in both regions. Following the developments in the crude oil and naphtha markets, players in China’s and Turkey’s downstream markets have started to express their uncertainty regarding their near-term prospects following a firming trend that has been in place for polymers since early February. Distributors in China have voiced uncertainties more often this week. “Many converters are currently focusing on depleting their stocks as they were already covered until the first half of April. Crude is softening but futures prices for polymers are still firm. So, there are lots of contradictory factors,” said a distributor in Shanghai. “Turkish buyers stopped building stocks owing to their cargoes on the way. The recent plunge of crude also played a major role in the cooling sentiment after sharp increases of the previous two months. The bubble in the distribution market which was caused by limited supplies has even started to ease,” said a converter in South Turkey.